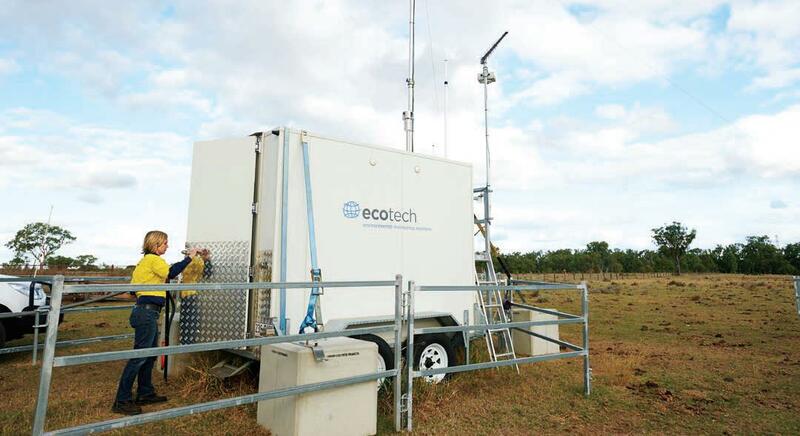 One of the five air monitoring systems designed and manufactured by Ecotech that now live-streams air quality data from the Surat Basin to the web for QGC, Origin Energy and CSIRO. As an integral part of a major CSIRO two-year project, Ecotech’s air monitoring instruments support the region’s first ever comprehensive air quality management program. The data shows air-quality in the Surat region as clean, or better, than locations in South-East Queensland. The air quality data and the modelling results will help residents feel confident that the Surat Basin is a safe and healthy region with clean air. CSIRO, through the Gas Industry Social and Environmental Research Alliance (GISERA) is leading a study that involves collection of air quality measurements through a network of five ambient air quality stations in the Chinchilla, Miles and Condamine region. Through the study, specialised instruments are measuring carbon monoxide, methane, volatile organic compounds, nitrogen dioxide, ozone and fine particles in the atmosphere. The data is accessible to everyone, which means communities and the general public can stay informed about air quality in the Western Downs region, how it compares to other parts of the State and how the levels compare to the Government’s air quality standards. The data will be used to model how natural and man-made emission sources including power stations, mines, livestock production, motor vehicles, bushfires, vegetation and the natural gas industry affect air quality in the region. By running the model with different emission sources switched on and off, the degree of contribution from different sources including the natural gas industry can be investigated. The above article is reproduced in part from QGC 2016, ‘Basin air quality data now live online’, Operations Bulletin, Issue 18, Oct, p. 1.